Jammu, April 11: Polling in Jammu and Baramulla Lok Sabha seats of Jammu and Kashmir ended on Thursday amid stray incidents of violence, some incidents of EVM malfunction and alleged misconduct by a security man at a polling station. Poll officials said the final voting figures in both the constituencies were being compiled and would be announced by Chief Electoral Officer (CEO), Shailendra Kumar at a press conference in Jammu later. Till 3 p.m., over 46 per cent voting was recorded in both the constituencies. National Conference (NC) and Peoples Democratic Party (PDP) told poll officials that a voter was beaten up by a security man deployed in a polling station in Poonch district after the voter refused to vote for the Bharatiya Janata Party. A video showing voters protesting outside the polling station against the high-handedness of the security man was posted by PDP President and former Chief Minister Mehbooba Mufti on her Twitter page. Andaman and Nicobar Lok Sabha Elections 2019: Phase I Voting Ends for Andaman and Nicobar Parliamentary Constituency, 70.67% Voter Turnout Recorded. In another incident, the Congress said the party's EVM button was not working in a polling station in Poonch district. It has lodged a complaint with poll officials. In Palhalan area of Baramulla Lok Sabha seat, a woman was injured when some youth pelted stones to disrupt polling in the area. Police immediately intervened and brought the situation under control. The injured woman was shifted to Srinagar for treatment. Except for these stray incidents, polling in both constituencies remained peaceful, due to heavy deployment of the security forces. Contrary to fears that there could be violence during the poll process in the Baramulla constituency, which spans Baramulla, Kupwara and Bandipora districts, voting ended peacefully with voters coming out in large or small numbers at different places as they wished. There were no reports of coercion to force people out of their homes to join the poll process. 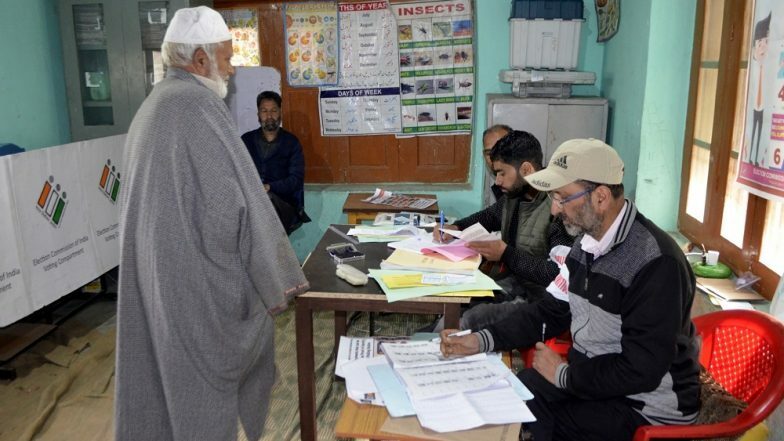 Very low voter turnout was seen in Sopore and Baramulla towns and a few other places where the separatist-called boycott appeal influenced local residents. Polling started in Jammu and Baramulla at 7 a.m. While queues of enthusiastic voters were seen in rural and border areas of Jammu Lok Sabha seat, polling was relatively muted in Baramulla. However, reports of voters turning out in good numbers came in from the border areas of Gurez, Karnah and Uri in Baramulla, while small queues were also seen in Sonawari, Shadipora and a few other places in the morning. The main electoral battle in the Jammu Lok Sabha seat is between the BJP's Jugal Kishore Sharma and Raman Bhalla of the Congress, while in Baramulla, it is likely to be four-cornered between Muhammad Akbar Lone of the National Conference, Raja Aijaz Ali of the Peoples Conference, Abdul Qayoom Wani of the Peoples Democratic Party and Independent candidate, Engineer Rashid. Counting of votes will be taken up on May 23.